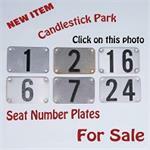 Stadium Seat Depot has for sale New replacement Stadium Seat Number Plates from numbers 1-50. Stadium Seat Depot has for sale New replacement Stadium Seat Number Plates from numbers 1-30. Stadium Seat Depot has for sale New replacement Stadium Seat Number Plates for Joe Louis Arena from numbers 1-30.